With the beautiful sunshine apon us once again it’s been a real pleasure the last few days working up at the yard. Everything seems to be going in the right direction, the yard is looking tidy, the cider we racked off 2 weeks ago has finally started to clear and is tasting great. I’m really looking forward to our own version of Steve Watkins’s Tricky cider and it won’t be long. The best news of all is that we have managed to carbonate cider in a bottle! You’d think that if we could put fizz into kegs, we could put it into bottles, however it’s not as easy as it sounds. A major issue is that the bottle has a large surface area and the cider ends up too warm to hold the CO2. Our solution is fairly straight forward in the end, instead of chilling cider by passing it though the carbonator, we’ve circulated the cider through the chiller and back into the holding tank until it reaches 2degC. The addition of a variable thermostat and using glycol instead of water as a coolant along the way. A lot of headaches over fizzy bottles, but persistance pays off in the end, finally we can send some samples out! And here’s some alternator news incase anyone was wondering what the outcome of welding the pulley to the shaft was… it came loose when I was towing a horsebox, with a very patient horse inside. I had to make some technical roadside adjustments using my engineering hammer. 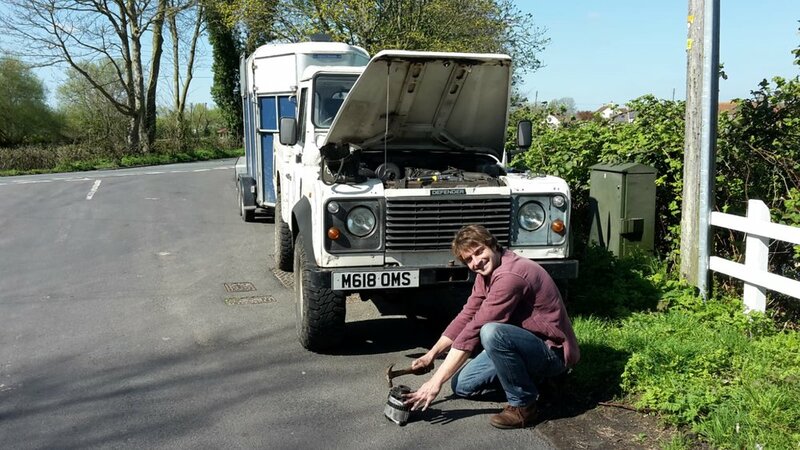 Fortunatly the landy is quite happy to drive along without power steering, alternator or water pump so chumps like me can do stuff like this and get away with it!